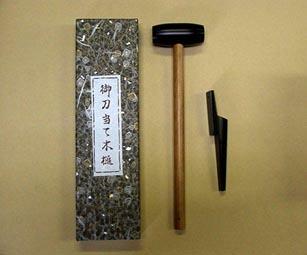 This tool is used to remove a frozen tsuka from the nakago. The head of the mallet is 2.25 inches (5.72 cm) long and made of polished rosewood. It is mounted on a long bamboo wood handle 9.50 inches (24.13 cm) in length. The rosewood splint is 5.25 inches (13.34 cm) long.